Here's another double duty card. 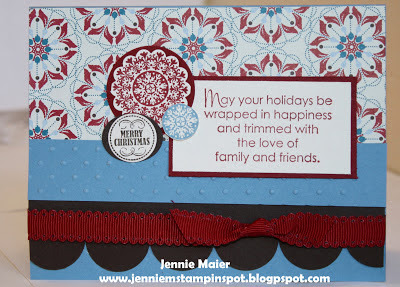 I used the MojoMonday Sketch#270 here along with the Splitcoast Color Challenge#404 here. The colors to use are Cherry Cobbler, Marina Mist and Early Espresso. More Merry Messages and Mixed Medley are the stamp sets with some Festival of Prints DSP. My Heart Goes out to Newtown!